I went to jail last night. I went there to read. If you know me, I’m probably on your list of Top 50 People Least Likely to Go to Jail, so I’ll share the backstory. When my parents retired, they returned from Washington, D.C., to their home in University Place, Washington (about an hour from Seattle). Their county, Pierce County, includes the city of Tacoma. 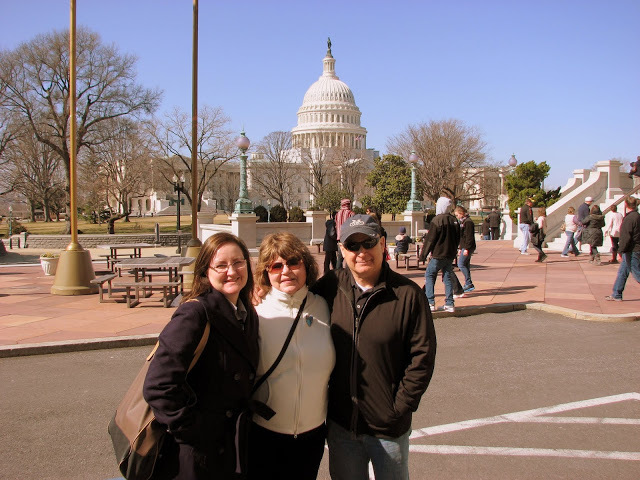 Here are my parents and I before the westward migration. The county’s juvenile detention facility is called Remann Hall. My parents have long been involved in issues related to children, education, and the court system. My mother served as a Court Appointed Special Advocate for years, and my dad serves as a Community Accountability Board Member for a program that diverts youth from the juvenile justice system and helps facilitate the making of better choices. How the Books Went to Jail. Now that you’re retired, what are you going to do for kids? And my mom said she wanted to start a book club for kids in detention, and Remann Hall Book Club began. It started small, and by small I mean funded and run completely by my parents. My dad is an accountant, and he was able to make them a 501(c)3. A couple of awesome bookstores in the area got involved, including the marvelous independent King’s Books. Other people began to contribute money and books, as well as volunteer. 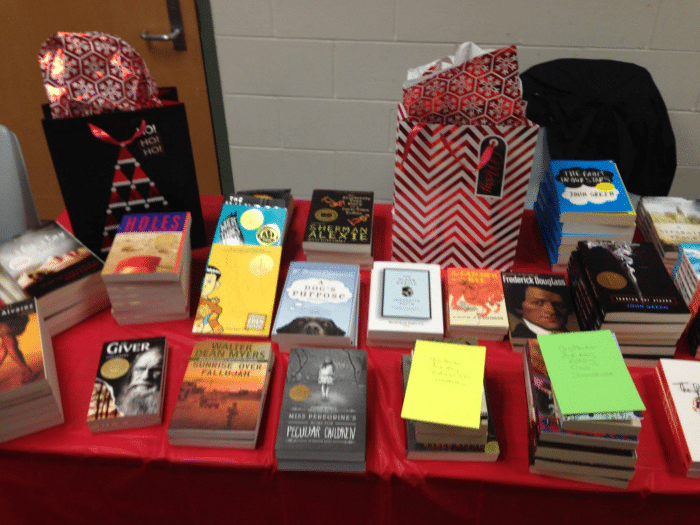 The Remann Hall Book Club has served nearly 800 youth since July of 2013. It meets twice a month, and this is how it works. My parents take copies of the book o’ the meeting over on the Monday before the meeting (the book club meets on Thursday nights). That may not seem like much time to read the book, but the youth have few demands on their time, and sometimes they read the books twice in the three days. They meet with four groups of youth (two groups run simultaneously) in two hours. Every youth who comes leaves with a brand-new book. King’s Books devotes a section of their website to the book club, and you can see a list of all previous reads there. When it Gets Really Cool. The author Joe O’Neill came to the book club and met with the youth. He is, by the way, very cool, as evidenced by the Black Ship Publishing site. 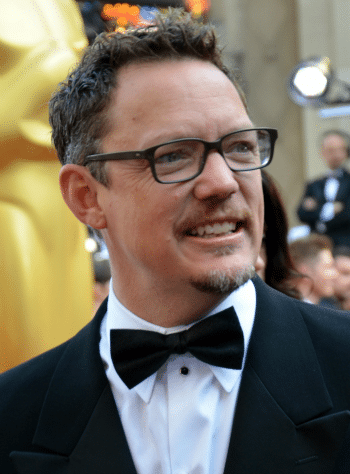 Even Scooby-Doo, Matthew Lillard came. He is, by the way, very cool, as evidenced by his general hipsterness. At Christmas, the youth get a gift. They get a book. No toys, no games, not even toiletries. They get a book. And they are grateful. My parents make the Christmas party very cool, with cookies (quite the treat in detention) and a festive atmosphere. It’s set up like a bookstore, with lots of copies of fresh, yummy books. Is that not off-the-scale cool? 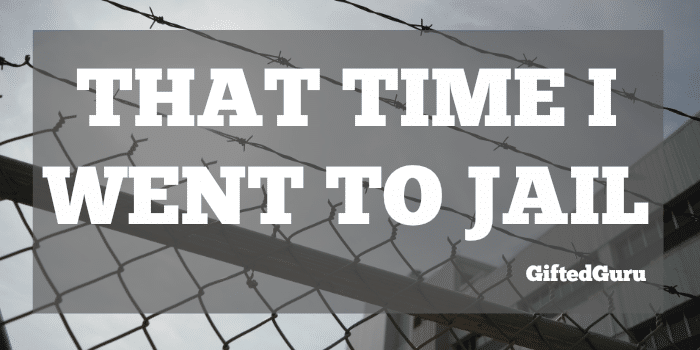 How I Went to Jail. My dad had back surgery, so I flew up to visit/help out. Book Club met while I was there, so off I went to jail. I swear it was the first time. 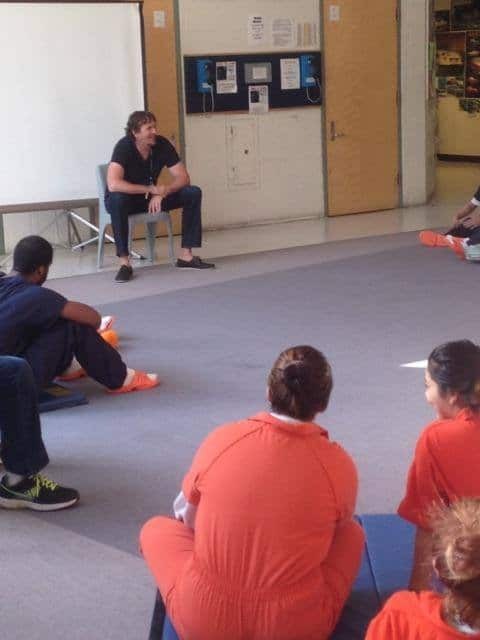 I was with a volunteer, and we met with six youth to discuss Wes Moore’s book The Other Wes Moore, while my mom met with the other groups, including the girls. Most had read it. A couple of them came to book club but hadn’t been there long enough to read the book. They all get a free copy of it that they get to stamp “This book belongs to …” and take with them when they leave. They often express surprise that people donate books and money so that they can have their own books to keep. Aside from toiletries and paper, the books are their only private possessions. They have meaning to these kids. My parents also bring lots of books kids can browse through and borrow. There is a Remann Hall Book Club library shelf there all of the time, too. Oh, and they’re getting a Little Free Library for just outside the doors of the facility. 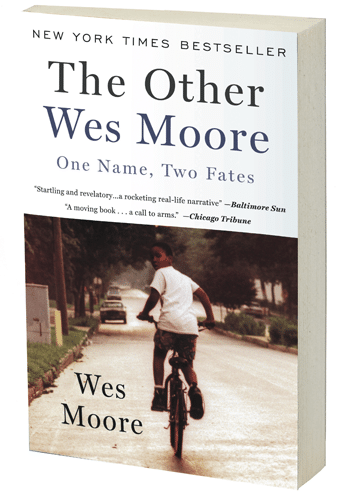 The book explores the lives of two young black men named Wes Moore whose lives began in very similar circumstances and took very different paths. We discussed deep themes of personal accountability, hypocrisy, fatherless families, the role of expectations, how friends can lead you astray, and more. These kids shared their deepest thoughts without fear of teasing from others in a way that was more supportive than any class I’ve seen. They eagerly turned to pages to point out and analyze text. They remembered details of the book in ways that shocked me. And I’m a gifted ed expert. A humbled gifted ed expert. After a particularly poignant moment when one boy, eyes shining with tears, talked about the impact of his own fatherless home, I asked him, “Will you be a good father?” He looked me in the eye in his jail jumpsuit, and he said with conviction, “I will be a good father. I will NEVER abandon my family.” I said, “I believe you.” And I do. They understood how you could end up feeling that your circumstances were beyond your ability to cope or manage them, yet not one of them ever made an excuse for their own behavior. Had the author been there, I believe he would have been amazed. Or perhaps not. The entire book focuses on the idea that ability and intelligence are present across all demographics. As we were wrapping up, there was a ruckus and the facility went on lockdown. We saw guards running like lightning towards one of the pods. The boys were hustled into their cells. The same boys who moments before were discussing literature at a level any high school teacher would be proud to facilitate were now locked up. They’ve made bad choices, but they are, at heart, kids. Kids who can read hard books and find meaning and application in them for their own lives. I left with a renewed appreciation for my parents, for the amazing people who work at Remann Hall who were, to a person, fabulous and kind and compassionate, and for the kids who have made bad choices and are paying for them. I would like to give a shout out to the Juvenile Court of Pierce County, and a special shout-out to the evening detention shift supervisor, Matt Martin, as well as my parents, Craig and Margaret Ross. They are there for kids. You can watch this video of one of the youths at Remann Hall and how his piano playing fills the halls with music. So that’s how I went to jail. With my mom. And I would go again, too. such great work being done to facilitate those young minds. Way to go Lisa! It’s all my parents and volunteers and wonderful staff! I just got to visit. It was so powerful! This makes my heart smile and dare I say, also makes me want to go to jail! Thanks for the spirit lift! I will take you there, Kate!!! One of my clients was being sent to a long term facility and had fallen in love with one of the series the book club supplied. He asked if I could find the new ones he had not read yet. I went on line and was surprised to find they were only $2.00 a piece so I got him 5 more for his journey. If anyone wants a good cause to donate to this one is awesome! Also, the piano player is looking for classical music so if you have any you can donate please send it on and state it’s for him. Great spotlight on a fantastic program. Thank you… and your parents too. When we asked author Wes Moore if he would share a favorite word with our readers, he wrote back: “Elevate”. Reading this wonderful story of our beloved Remann Hall Book Club and the gracious comments elevates my spirit. The greatest learning I have had from this experience is that it simply does not matter to me what the youth have done in the past. What matters is their future, and I believe their future is brighter when they are exposed to books.